EA Sports has long had the best sports games on the market, from the award-winning Madden franchise, to the very realistic FIFA Soccer series, EA Sports has shown that you do not need over the top antics, or ESPN commentary to make a sports game fun. You see, EA Sports knows one thing: you don\'t need the players\' names. Sure, they enhance the overall experience of the game, but, in the long run, they really don\'t mean a lot to the video game franchise. Take a look a NCAA College Football 2003. The game didn\'t have player names because the NCAA wouldn\'t allow free distribution of the players\' names. In place of that, EA had two ESPN commentators record over 1,700 surnames (last names, folks) so that your created player\'s name would probably be on the list of surnames recorded. This is not the case with FIFA Soccer 2002, last year\'s installment of the premier soccer franchise, which is also the game which made the series the #1 Best-Selling Soccer Franchise. It might be because of the players, the ball physics, the graphics; perhaps it is because of the commentary by John Motson and legendary soccer star Andy Gray. I think it\'s because of one thing: EA Sports makes soccer games fun by bringing f?tbol to the rest of the world. Really excellent. This was one of the first games I bought for the Gamecube, and I have never regretted it. All of the players look reasonably close to their real life counterparts, while you can see simple things in the stadium, like flags waving in the air. The ball bounces and moves realistically, and player animations are really good. Sometimes, however, the animations can leave you wanting more, such as when the ball is about to go out. Shouldn\'t the player be able to move the ball back into the playing field? This is fixed in 2002 FIFA World Cup, but that is a different game, and a different review. Once in a great while, there is slowdown on the play, which is quite annoying when you are in the midst of an intense defensive or offensive move. And sometimes the ball behaves unrealistically. Every so often in a real life soccer game, the ball will come to a rest without any players able to get the ball and move it around. This doesn\'t happen in FIFA 2002 because the ball is tethered to the player. Even though this is rather unrealistic, ball physics couldn\'t be better. The ball bounces when you press the right button, and the ball can even be curled by pressing one of two buttons while passing. Very, very fun. It\'s even fun for people who don\'t like soccer. You see, the simple dynamic of trying to get the ball into the opposing team\'s goal is classic. However, this dynamic in the game is different because you can use different strategies to outsmart and outwit your opponents. One of these moves is called the one-two. A technique now popularized in hockey, the one-two is simple and effective in FIFA. All you do is flick the C Stick in any direction, and your character will pass the ball to another player, who then waits for you to maneuver around an opponent, and then the other player will pass it back to you. This move is not only useful, but it also shows how many different strategies are there for you, those that are preset, and those that are designed by you on the fly. 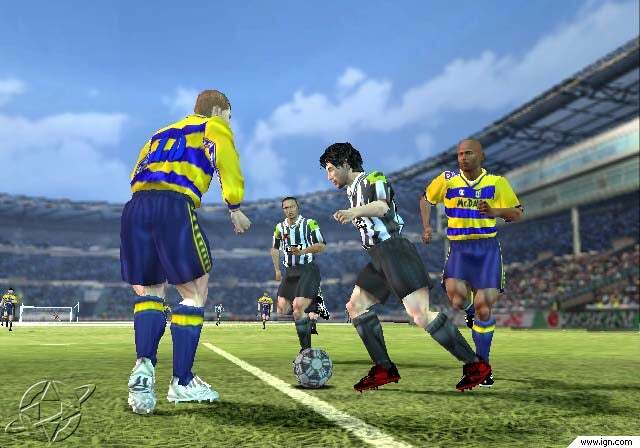 There are also many different types of game play modes in FIFA Soccer 2002. Of course there is the mandatory Quick Match, but, in addition to that, there is Season mode, as well as Road to the FIFA World Cup. While Season is self-explanatory, Road to the FIFA World Cup takes your team through the different rounds of the World Cup in an effort to qualify for the prestigious match. In addition to actual game play modes, there are many features that allow you to extend the life of FIFA 2002. Just like many sports games of its ilk, FIFA 2002 has a Create-a-player function, which allows you to create your own player, as well as Create-a-team, and Create-a-tournament. The last mode has several options that allow you to customize and change nearly every aspect of your tournament. The sound in this game is unsurpassed for a sports game. The two commentators, John Motson and Andy Gray, both speak with with a mixture of efficiency and hilarity, although their lines are not varied enough, and there are a lot of repeated lines during a game. If you choose to play without play-by-play commentary, then you have to listen to the sounds from the players on the field, as well as the crowd in the stadiums, cheering and chanting. In fact, the crowd sometimes mentions the team names, which is a nifty little audio feature. Another cool thing, if you turn off the commentary, then you can actually hear the different languages from the players\' home land. Personally, I don\'t think I have ever heard better sound in a sports game than in FIFA 2002. Really very intuitive. All you do is press the A button to pass, while the B button lobs the ball up field. Hold the button down while receiving the ball to head it, and hold the button down when you want to pass or lob to tell how much power you want behind the kick or pass. When a penalty shot is set up, the corresponding button name appears over the player that you want to pass to. Slide tackling could not be easier, and curving the ball is amazingly easy too. When you want to achieve this, you just hold down L or R on the Gamecube\'s controller, and the ball curves to the left or right, depending on how you want it. There is no question as to whether or not the ESRB rated this game the way it did. There is absolutely nothing objectionable, to my memory, that occurred in this game. There is no , except for when you do an own goal, where the offending player knocks the camera man down, so parents should have nothing to worry about. The soundtrack is generic techno, so, unless you have something against techno, go with this game. Anyone who likes soccer, or any type of sports game, will find something to like here. The game is family friendly, and it is one of the best out there. Plus, nowadays you can find this, and FIFA Soccer 2003, for cheap, so if you have twenty bucks to spare, and yearn for an excellent game, pick this up today.